Amp Americas' high capacity fueling stations are well suited to serving virtual pipelines, fast. 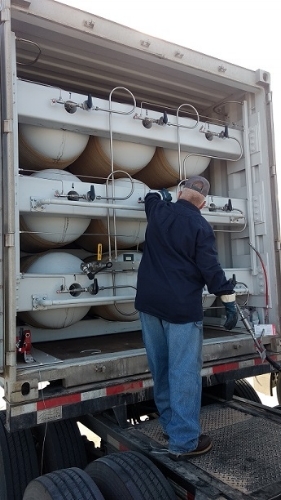 We offer both fueling services for users who provide their own trailer transportation, as well as consultation for virtual pipeline services at your site. Receive all the benefits of clean burning, cheap, American natural gas wherever you need it. Maverick Energy Services uses our Harrold station to rapidly fill gas transport modules and deliver CNG to the oilfield where they use the gas for well stimulation as part of their completion services. All of our other stations have high flow nozzles well suited to large fills. Contact us to inquire about service or to find a virtual pipeline provider. To find out more about how Amp can help drive down costs in your business, please fill out our contact form below and a member of our virtual pipeline team will follow-up with you within 2 business days. A member of our virtual pipeline team will follow-up with you within 2 business days!